Fresh from recording their new album Home, B2M will treat audiences around regional Western Australia to their high energy music during their album launch tour in February and March 2015. B2M were nominated Band of the Year at the prestigious 2012 Deadly Awards ad have also launched a ground-breaking cyber safety clip, Strong Choices, which addresses the problems of inappropriate use of digital media. B2M are from the Tiwi Islands, Northern Territory and their name is taken from the two Tiwi Islands, Bathurst and Melville. 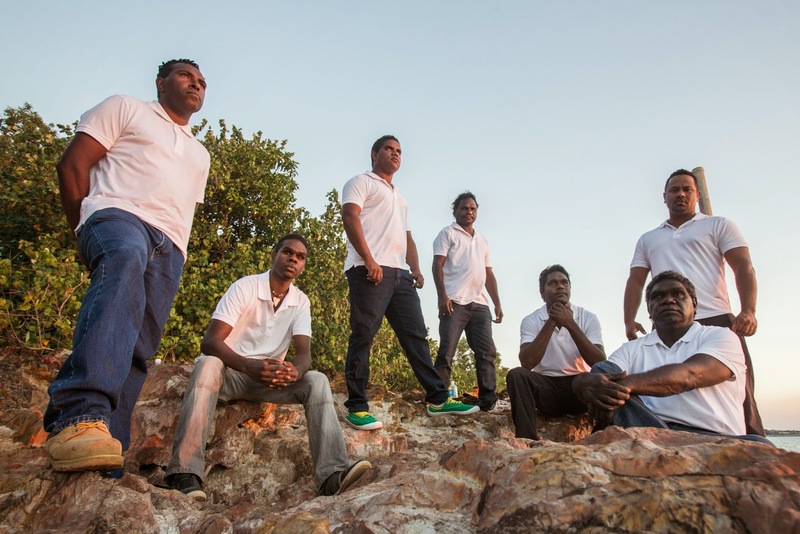 The band sings in both English and Tiwi language, promoting positive attitudes through their upbeat tunes. The six-piece R&B group will get Ravensthorpe audiences dancing at the Ravensthorpe Town Hall on Wednesday 4th March during their tour to 11 regional venues from Broome to Esperance. "B2M...wow, the music, the joy, the talent- it was contagious. It would have been a standing ovation that demanded an encore- but everyone was already on their feet dancing! We couldn't get enough of them," said Phaedra Watts, Artistic Director of the Nannup Music Festival. "what an opportunity for WA regional communities to see B2M play live. Not only are these men respected role models in their community, but each member is a well -known identity in Australia's Northern territory. The message they share through their music, encourages young people to make positive choices and changes in their lives." says Jessica Machin, Chief Executive Officer of Country Arts WA. The tour is presented by Country Arts WA and sponsored by Healthway promoting the Mentally Healthy WA campaign message, Act-Belong-Commit, as part of the 2015 Shows on the Go program. Healthway Executive Director, David Malone said: "The Act-Belong-Commit message encourages people of all ages to take action to protect and promote their own mental well being. Healthways' partnership with Country Arts WA for Shows on the Go touring programs is an ideal way for us to get this important message out to many communities throughout regional Western Australia." "When people come together to enjoy these performances this helps to generate a sense of belonging which is a vital part of positive mental health. By joining family, friends and neighbours for the B2M band performance, people in these communities will be showing that they know how to Act-Belong-Commit." Bookings: Ravensthorpe Community Resource Centre on 9838 1340 or at the Hopetoun Community Resource Centre. Bus Available from Hopetoun, $5 per adult, children (0-15yrs) FREE. Please book bus on ticket purchase. Asian style meals available to purchase on the night, $15 adult, $5 children plus individual additional foods e.g. spring rolls for separate sale. Soft Drinks available to purchase on the night. No bar, strictly no BYO...this is an alcohol free event. Inquiries to RRAC Coordinator Mel on 0427 381 530. Ticket prices have been heavily reduced due to fundraising by the RRAC and sponsorship from the Ravensthorpe Shire's Youth Focus Network. Last Sunday afternoon, February 8th, was a warm one. But it didn't stop a crowd of just over 100 folk from coming along to the Fringeworld Kids Comedy Gala at the Ravensthorpe Town Hall! The event was a first for the RRAC and came about after meeting Caitlin from Fringeworld at the Arts and Edges Summit in Kalgoorlie last October. Despite half the RRAC committee being away on holiday, school just going back and having no sound or lighting equipment that we could use...we decided to push on and present the show anyway! Caitlin and the team at Fringeworld were extremely helpful, as was Tim Currie and his crew at the Esperance Civic Centre who kindly allowed us to use his expertise and some gear to get the show happening (thanks Ross Beckett!). So between all of us, and a few volunteers over the weekend to set up lights and sound...the show did go on! And what a show it was! Hosted by comedian Bert Goldsmith and kicking off with the talented Will Pickvance (straight out from the UK and sweating slightly!) performing his show "Anatomy of the Piano" before ending in a flurry of acrobatics, hats and lots of plastic balls with the hilarious Trash Test Dummies. Enjoy these photos from the show! Bert covers the front row in confetti before running through the basics of applauding and hooting like a monkey. Will's piano playing was mesmerising, funny and poignant...like a Leunig for the ears! It was a great turn out considering the sweltering temperatures...the hall actually remained cooler than outside for the duration of the show! After taking Will's milk crate stool to collect confetti in, Bert replaces it with another so that he didn't have to keep sitting on the floor whilst he played. Will dissects the piano and we get to see how it works! A quick scene change and the kids get to inspect the insides of the piano themselves. The Trash Test Dummies hit the stage with lots of noise before settling into some ballet. Two of the Trash Test Dummies took to hiding in the crowd as the third became cross with them and went on a rampage with a big rubbish bag! Nope, cant seem me here! The poor Fringeworld technician cops it! Suddenly the bag bursts open and hundreds of plastic balls hit the stage and bounce into the audience! Bert and the kids start throwing balls back at the trio! Just in time for some hat tricks. All the kids then came up on stage to help pick up the balls. 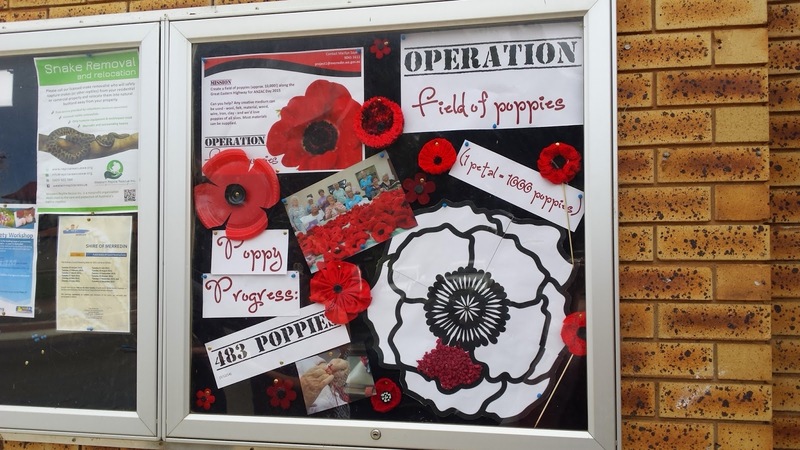 Through contacts made at the Arts and Edges Summit last year in Kalgoorlie, the Shire of Merredin and the Merredin Fine Arts Society are reaching out for support for their Operation Field of Poppies project. 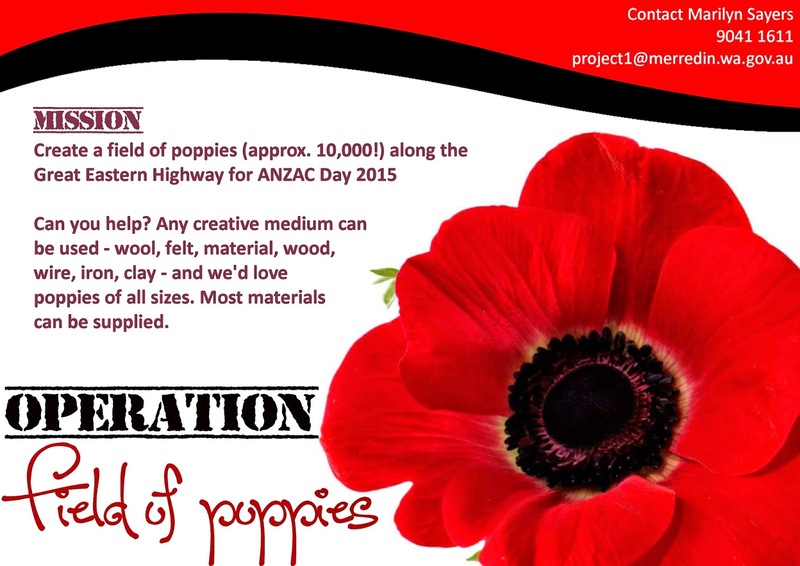 The project is targeting 10,000 poppies to line the town’s main road. 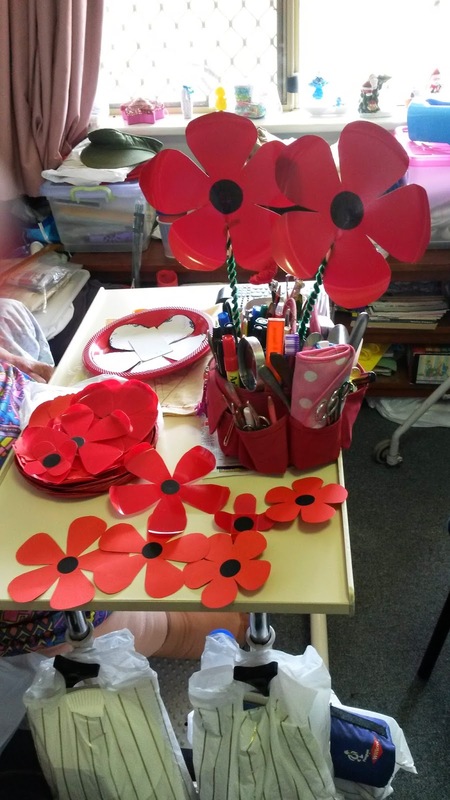 Poppies can be made from recycled plastic bottles, plastic plates, clay, knitted, crocheted, sewn fabrics, wood or steel. Community Liaison Officer at the Shire of Merredin, PO Box 42, MERREDIN WA 6415. If there is a big cost in getting them sent, Marilyn has asked for people to contact her on 08 9041 1611 to work out a solution.